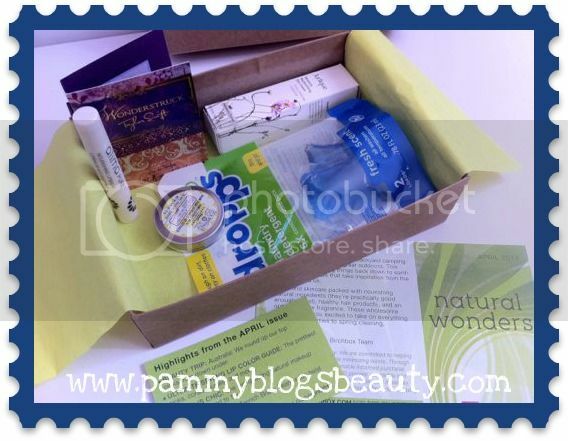 Pammy Blogs Beauty: April 2012 Birchbox: Box Opening! 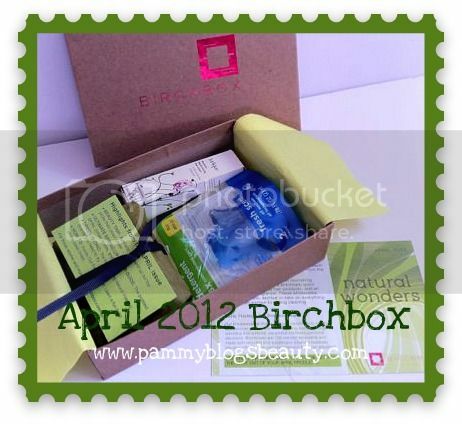 April 2012 Birchbox: Box Opening! Hello Beauty-Box lovers! It is time for another Birchbox "Box Opening"!!! Oh how I anticipate this box every month! In the vast sea of beauty sample service subscriptions, Birchbox continues to be my fave. The packaging and presentation is beautiful, the box contents are exciting and generous (mostly deluxe sized...but some full sizes ocassionally as well! ), the website and Birchbox blog has great tips, videos, and more, and earning points towards discounts on the Birchbox site is always a great perk! Birchbox never dissapoints! 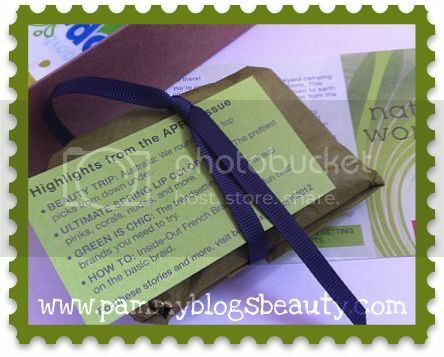 I have sampled and discovered many great products through the Birchbox sample boxes. But more than anything, subscribing to Birchbox has just been so fun! Are you new to my blog and are not sure exactly what Birchbox is? Well, it is a monthly beauty sample service. For $10 per month, Birchbox sends a beautiful box full of 4-5 deluxe sized samples right to your door. The samples chosen for you are based on your beauty profile that you set up online. You can review the products/give feedback on the Birchbox site to earn points towards product discounts in the Birchbox store. The samples are generous and from mostly high end or botique brands. Curious about the contents of some of my previous boxes? Here are some of my previous box opening posts: Birchbox Introduction Post, Jan 2011 Birchbox, Feb 2011 Birchbox, March 2011 Birchbox, April 2011 Birchbox, May 2011 Birchbox, June 2011 Birchbox, July 2011 Birchbox, August 2011 Birchbox, Sept 2011 Birchbox, Oct 2011 Birchbox, Nov 2011 Birchbox, December 2011 Birchbox, January 2012 Birchbox, February 2012 Birchbox, and the March 2012 Teen Vogue Birchbox. What has Birchbox decided that I need to try this month? Any new potential faves inside? Keep reading to find out! Also of note: Birchboxes are made from recycled and sustainably sourced materials. Plus, you can recycle your Birchboxes! Either straight up recycle them, or reuse them! I have been using mine to box gifts. Also, I use them flat and open as little containers to organize my makeup in my makeup cart. My fellow Birchboxers, what do you do with your old Birchboxes? What is in the April Birchbox??? Alima Pure | Organic Nourishing Lip balm in Rhubarb (Full-sized cost $7, sample size: full sized!!! Whoo-hoo! ): Mmm...this lip balm smells so good! Minty! This is an organic tinted lipbalm. It contains great ingredients like antioxidants. It is a pretty "my lips but better" shade. Love!!! I am pretty much a lip balm addict. So, I always like getting these in my sample boxes. Plus, the shade is nice! Both wholesome and chic, this tinted balm is made with pure plant butters and delivers a natural flush of color. J.R. Watkins | Hand and Cuticle Salve (Full-sized cost $7.99, sample size:.25 oz): Sweet! I am a big lover of cuticle salves!!! Typically I have a Burt's Bees or a little pot of LUSH's Lemony Snickett in my purse, nightstand, diaper bag...you name it. My cuticles are so dry and ragged that I like to have a tin handy no matter where I am. My theory is that I can beat the dry cuticle curse with constant application (and really, that works!). So, with that said, you know that I love getting a little cuticle/hand salve in my Birchbox!!! Yay! I have never tried anything from J.R. Watkins before. The salve has a buttery feel and a very light and pleasant scent. It seems a bit greasy at first. But, it does sink in! Slather on this creamy balm pre-manicure. Its's full of natural moisturizers to keep your hands and cuticles super soft. Jurlique | Moisture Replenishing Day Cream (Full-sized cost: $40, sample size: .5 oz): What a nice sized sample! I am not going to open it to sniff it just yet as it is a metal tube that is sealed and I am in the midst of a ton of skincare testing. I do look forward to eventually trying this out. Usually I do not use a day cream as my SPF can double for moisturizer. But, this might be nice to layer with SPF in the winter when I need additional moisture. Protect your skin from dryness with this botanical cream, which is infused with rosehip and avacado oils. Wonderstruck Eau de Parfum (Full-sized cost: $49-$59, sample size .04 oz): My collection of small perfume vials on cards continues! LOL, seriously, between Sephora and Ulta orders and my Birchbox subscriptions, I am up to my ears in tiny perfume samples! I mean, how many of these do I really need. Ya'll, seriously... I am on a mission to use these! While I do not find that these add "value" to the Birchbox (we all know that you can get perfume samples for free), I do still like the inclusion of these in my Birchboxes. I have discovered a few great scents that way. My husband likes to purchase and pick out my perfumes. I am finding that wearing these little samples is a great way for him to smell the scent on me and then (hopefully) get inspired to go out and purchase it for me, lol! We just went out of town and I took a few of my Birchbox sample perfumes with me. He found a few that he really liked! I really like the scent of this sample! Is it just me, or is it reminiscent of Bath and Body Work's Twilight Woods? Plus, the bottle of this is just gorgeous! I always admire it in the department stores. Lifestyle Extra: Dropps | Laundry Detergent: Okay, laundry detergent?!?! I know, this is an extra. Normally Birchbox includes items like a fancy chocolate or a hair-tie...Somehow getting laundry detergent just isn't as exciting. Maybe it is just because laundry is such a chore (especially with a 4-month old at home, lots of laundry here!). When I think of Birchbox, I think of luxury products and self-pampering. Somehow laundry detergent just doesn't fit in. Plus, I am allergic to most laundry detergents (I have to use Tide's unscented). All-in-all, I really do love this month's Birchbox. The items vary for me individually. But, as a whole, the box is great! Sure, I have a million perfume samples. But, I am thrilled to have a sample of Wonderstruck! The Alima Pure tinted lip balm (full sized!!!) and the J. R. Watkins Hand & Cuticle Salve are both total hits! The Jurlique Day Cream is a great size and an item that I am curious to test. The laundry detergent is a bit silly. But, it is an extra. There is absolutely no question that the value of this box far exceeds the $10 cost. I think that the pleasure of subscribing to Birchbox extends far beyond evaluating the box on monetary value. These products are just lovely! They are from boutique or high end brands that I really want to try. Also, I have discovered great new products through my Birchbox samples. Plus, the beautiful wrapping and presentation of the box make me feel like I am unwrapping an individually chosen "present" of a box every month. In the vast sea of sample subscriptions that are out there now, Birchbox continues to be my favorite! I already can't wait to see next month's box! Let the anticipation begin again!!! Isn't the anticipation half of the fun? I got none of these in my April Birchbox. Instead, I got stuff that I really don't care about. I did receive the identical Birchbox that another blogger did (can't recall who)and she was none too happy, either. I'll give them another month, tho, and then maybe cancel. Disappointing. @Isis04-Sorry your box was dissapointing!!! Heres to hoping your next Birchbox is better. That balm looks fun :) I think I liked last years April box more than this years... well, based on what I've seen people get this year.